And what is the biggest prophecy Christians wonder about? In the years after the Great Recession, economic disaster theories had been in vogue, such as with The Harbinger  and The Shemitah . Yet with the flop of such invented prophecy theories and Trump's "make America great again" (MAGA), the top prophecy focus has returned to the mainstays: the Second Coming of Christ and the Rapture. To be sure, the poll helped me to understand better how unfamiliar Christians are of the history of rapture predictions and NT prophecy about Christ's return. As a person who has studied prophecy and helped others who were also interested or studying, I was a bit naive about the greater Christian audience, those who never even heard a teaching on prophecy. (For example, I learned later that a substantial portion of Christians never read Revelation because it seems too scary or dark). I also realized that while I hear about every popular prophecy prediction each year, most Christians hear nothing of them except when they go up on billboards across America like Harold Camping did in 2011 . 2 Thessalonians 2:9-11 — 9 The coming of the lawless one [Antichrist] will be accompanied by the working of Satan, with every kind of power, sign, and false wonder, 10 and with every wicked deception directed against those who are perishing, because they refused the love of the truth that would have saved them. 11 For this reason, God will send them a powerful delusion so that they will believe the lie [that the Antichrist is God  - 2Th 2:4]. In the past year I've learned that "those who are perishing" refers to not just non-Christians but also Christians, "few" of whom are saved according to Jesus' warning  This happens because Satan deceives the whole world (Rev 12:9) including Christians (Mt 24:4-5) because most want to be left in their comforting reassurance of salvation rather than investigate Revelation's warning about deception (had they read it). If you burst someone's bubble, they may become very "unchristian-like" on you, just as Jesus warned about truth telling (Mt 7:6). As history consistently shows , the truly risky proposition is stating when Jesus will come back or the year of the fulfillment of any other Biblical prophecy, for that matter. Why are these prerequisite events not common knowledge? Because most believe in the "pretrib rapture" doctrine  and the related doctrine of "imminency." This imminency teaching states that the "pretrib rapture can come at any moment without any prerequisite event." Just as the pretrib rapture is false and unscriptural, so is the imminency teaching used to justify it. Similar to working with a real jigsaw puzzle, if you have one piece out of place, it can stop you from completing the puzzle to see the picture that it was intended to reveal. The more sure you are about that out-of-place piece being right, the more blocked you will be. For example, having the Rapture in the wrong place (before the Great Tribulation)  in the sequence of events effectively blocks understanding of end time prophecy. Psalm 83/Isaiah 17 War - Damascus Destroyed — Rather than the Rapture, the next event in prophecy  is a swift war in the Middle East between Israel and many of her Arab/Islamic neighbors. You do not need a Bible to tell you this, as many secular sources expect one due to the tensions between Israel and the Arabs and Iran (not Arab, but Persian). The concern over Iran's nuclear program has only added to this. The outcome of this war will be the destruction of Damascus (Isa 17:1) and several other major Arab cities and regions, along with much devastation in Israel. Obviously, the attack has still not happened because Damascus remains a city to this day (whether you consider it "in ruins" by your First World nation standards or not :-). The Sixth Seal/Wormwood — If you read Revelation 6:12-17 carefully you will see that it depicts the entire population panicking and running for cover in response to signs in the heavens and a tremendous global earthquake  on earth moving every mountain and island out of place. It is obvious that nothing like this has happened since the first century when it was written and when knowledge of the Lamb of God (named by those panicking: Rev 6:16) has arrived. By the way, this event is the very "sign of the end"  that Jesus told his followers to watch for (Mt 24:7-8=Lk 21:10-11=Joel 2:30-32=Rev 6:12-17). God's end time escape instructions  shared by Jesus, Joel and Revelation would then play out for the faithful . Third Temple — Several passages describe a Third Temple on the Temple Mount  with sacrifices going during the Great Tribulation (Rev 11:1-2; Mt 24:15; 2The 2:3-4). The Antichrist is even described as sitting in this end time temple as part of his declaration of himself as God (2Th 2:4). Obviously, there is as yet still no temple or even a construction project under way for one, nor sacrifices yet. Speaking of the construction, some say that everything is already being prepared for this temple and it can go up fast, in less than a year. Even if that's true, under the current political situation they still could not break ground on the Temple Mount without the Arabs approval given their historic belligerence against any Jewish worship on the Temple Mount. The Arab control and power needs to be broken first, and that is not going to happen without a war, probably the future Psalm 83 war as above . Abomination of Desolation — The Great Tribulation starts 30 days (as in the 1290 - 1260 days) after the Abomination of Desolation is stood up on the Temple Mount  (Mk 13:14). The abomination refers to the Image of the Beast statue  being erected for worship (Rev 13:14). At the same time the Third Temple sacrifices are halted by the Antichrist. This is another unfulfilled prophecy as only the Antichrist can accomplish this and he is not here yet. Great Tribulation — This is the most obvious and well-known preliminary end time event. According to Daniel 9:27 = Matthew 24:21, Jesus must return after a period of "Great Tribulation." During this Great Tribulation, the Antichrist will rule over the world for 42 months  (Rev 13). He will force all the unsaved (Rev 13:8) to take a mark in their right hand or forehead during that time. Plainly, we are not in the Great Tribulation and no mark of the beast  has been issued yet. The Wrath of God/7 Bowls — The seven bowls of God's wrath  immediately fall when the faithful leave temporarily to heaven (Rev 15:5-8) (for the marriage supper of the lamb), just as Jesus described in saying it would be just like as in the days of Noah and Lot when one are taken (the righteous) and one are left (the wicked) . The Second Coming — Finally, Jesus "returns to earth" on Yom Kippur/The Day of the LORD  to fight the Battle of Armageddon (Rev 19:11-21). He brings back with him the raptured and resurrected saints from the marriage supper of the lamb (Rev 19:9) in Heaven (Rev 15:5-8). Then they reign for the Millennium . However, the above list does include the "Event A" from my earlier explanation: the Psalm 83 War . Until we see that event, the end time roadmap/final seven years has not begun. This means we could still have years or even a decade (or two?) before the end times events start and finish with Jesus' return. 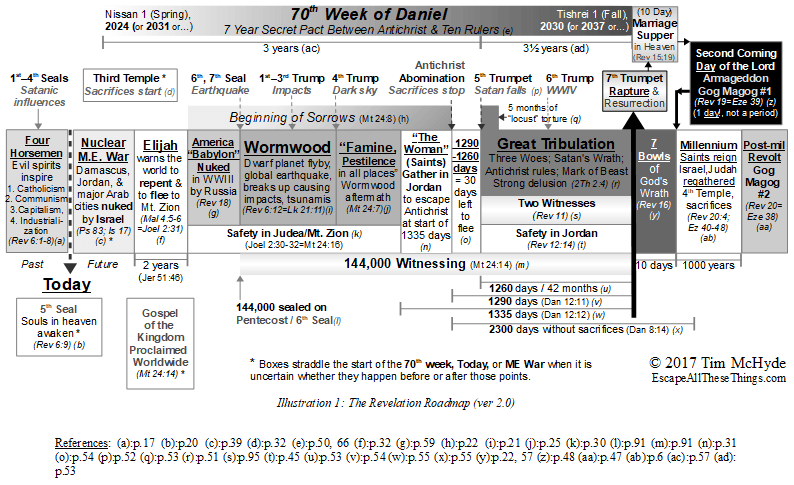 For sure, as long as the Damascus war and destruction is unfulfilled, we have a good minimum of seven years before Jesus can come back, which is the length of the 70th Week of Daniel time frame in which all but one of the events above must take place. How? Through the special insight that Jesus can only return in one out of every seven years: a Sabbath year . The Sabbath year commanded to ancient Israel not only gave them a blessing of a year of rest from planting their fields with the associated promise of bounty in the sixth year before that. It also was prophetic like all the Torah (Mt 5:17-18). That means it had a end time meaning and fulfillment. The fulfillment of the Sabbath year is that it pictures the Millennium peace and rest , the 1000 period that begins with Jesus' return. Just as the ancient Israelites rested their fields and experienced God's blessing, provision and peace in that year, so will we in the Millennium. 2026 is not too far off which is why I'm sad to report that the closer we get to it, the more confirmation keeps falling into my lap about it, despite me not wanting it to be true. For example, I already have had several dreams and developments in my own life that led me to share publicly why I am convinced the end begins in 2026 . Then in 2017, when Trump announced the decision to recognize Jerusalem as Israel's capital and move the US Embassy Jerusalem, God gave me a dream . I never asked for confirmation about 2026 for obvious reasons, but it came anyway in remarkable fashion: a dream in three separate, interrupted sleep segments. That morning I released my article on how God had confirmed through the dream that Trump's provocative announcement was prophetic and leading to the nuclear Middle East war . It was very angering to the Muslims with immediate demonstrations and followed by calls to make a bigger Arab alliance against Israel. Many others have written me since then to say they also heard from God that Trump's announcement was a move towards end time prophecy. But time will tell on that and whether I understood my dream properly (1Co 14:26, 29). People often point to the multiplying and worsening problems in the world as proof that "the end is nigh"...(for sure this time!). However, social or economic problems are not on the end time roadmap. At best they are just reasonable-sounding speculations. And if you study history, every generation has been able to point to something getting worse as proof that they were the "last generation." Relative and subjective arguments like that don't compare to the absolute specific description Jesus gave of the end time sign . Ultimately, let's not forget that Jesus himself is the origin of this message that "the end is not yet"; or "the end is not by and by" (Mk 13:7; Lk 21:9) until certain (unmistakable) global conditions appear . Jesus did not teach "imminency" or to expect his coming any and every day. Instead, He encouraged constant prayer and vigilance to not allow yourself to backslide  because you don't know when you will die or when he will come (Lk 12:45). So, rather than this end time wisdom having disadvantages or a curse, there is a clear advantage to it compared to the popular "the end is nigh" thinking which focuses people on something that is not going to happen yet. The continual "invented prophecy" predictions about the end coming around every corner every year  keeps many people in fear. That needless anxiety (Php 4:6; Mt 6:25) can lead people to live under costly short-term thinking and make very poor decisions for themselves and their family. I've seen many sad cases of this (including my own experience for a time when I still had not discovered what this article shares ). It truly is better to know the truth and act off of that—prayerfully and righteously—rather than off a misunderstanding which opens you up to constant false alarms or paranoia or influences you to make bad choices or live in dread. I agree that it is disappointing to hear that Jesus is not coming in 2019 or any time soon after that. The good part of this is that by the same principle, many bad things like Wormwood  and the Great Tribulation are also certain to not come next year either! It means you can stop worrying about the end coming suddenly and unexpectedly as long as the situation of the past 2000 years of no prerequisite events continues. You can focus instead on making sure you are saved  by getting right with God through Biblical repentance . 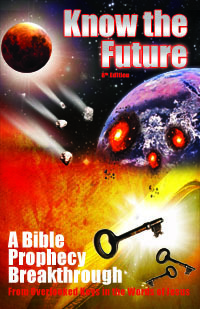 If you are interested in learning all the things you do not have to worry about in 2019 without it taking years of personal study and/or in supporting this ministry and "help get the word out," check out the book Know the Future  offered on this site. Orders directly support my writing of free articles. If you want help on seeking the narrow path Jesus spoke about as the only one "leading to life" that "few find," my supporter content will help you greatly . If you want to understand why I finally wrote an article to answer the question that people always email me on "When do you think the end is?," see my in-depth study on 2026 in prophecy .